Solasafe has achieved an Internal Surface Finish Group number of 1-S according to performance determined under the conditions described in ISO 9705:1993 required by NZBC clause C3.4(A). Performance is achieved through MBIE Guidance on European Classification. Solasafe corrugated polycarbonate sheeting provides 99.9% protection from the harmful UV rays that cause sunburn and skin damage. 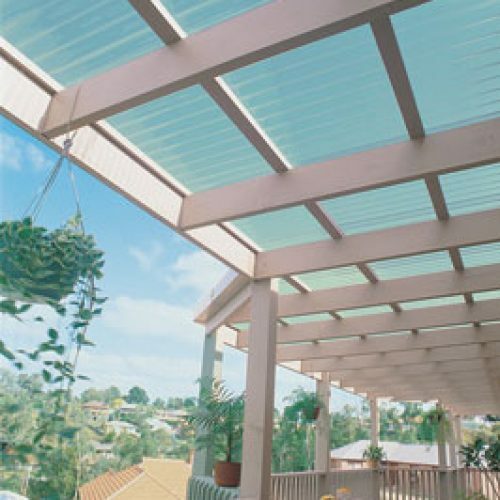 Used as skylighting or roofing, this polycarbonate corrugated sheeting can help you create an outdoor living area in your home to help your family safely enjoy the New Zealand lifestyle, and also add value to your property. Solasafe sheeting is manufactured from polycarbonate, an advanced polymer with optical and physical properties that cannot be matched by other materials. With impact strength of up to 150 times that of tempered glass, Solasafe polycarbonate sheeting will not be damaged by normal hail. It is easy to handle and install and the corrugated sheets can be curved, so you can create a stylish look. 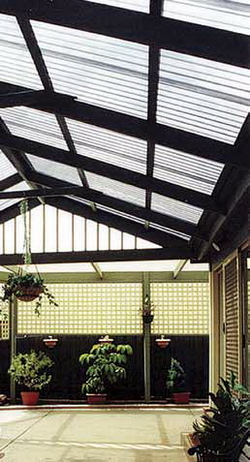 Solasafe polycarbonate sheets come tinted or clear. It is stable at temperatures of -40° to +110° and does not distort or soften in heat; however, it is advisable to store Solasafe sheets under cover, prior to installation. 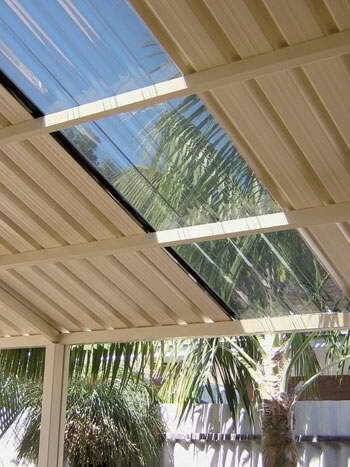 Solasafe corrugated polycarbonate sheeting is warranted by Ampelite to give long service under normal usage. Protection against excessive yellowing of the sheet (as detailed in the Warranty) is for lifetime from date of purchase. Damage from heavy hail (up to 25mm in diameter in high winds) is covered for ten years. Solasafe sheeting is available in a range of colours and profiles to suit your home and surroundings. Clear sheets transmit some 90% of glorious daylight; see the light and heat transmission tables for the percentage applicable to other colours. In cooler climates, clear sheeting allows good heat transmission, while in hot climates, tinted sheets provide a reduction in transmitted heat as well as reduced glare. Often tinted sheets are used to blend in with existing colour schemes or other roofing. 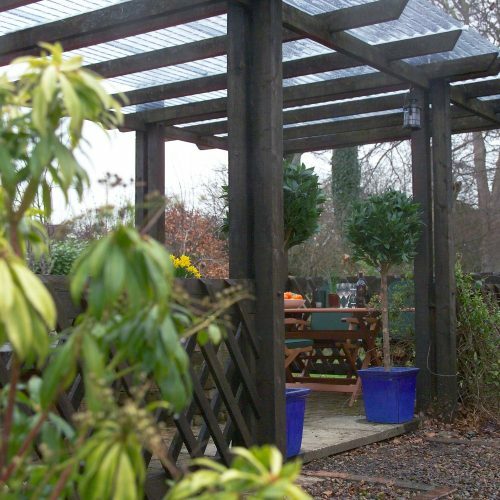 If new sheeting is to be used with existing polycarbonates, please check your colour prior to installation as some minor variations may occur. Before you order materials and commence building, please check the spanning table below, which will give you the maximum distance between battens and purlins. The sheet’s length and sheet coverage table will help you calculate how many sheets you require. 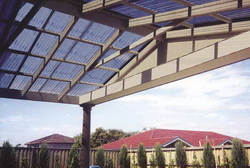 Solasafe is fixed and flashed on similar principles as steel roofing. Minimum fall is 5 degrees. Start by fixing the first sheet at the end farthermost from the usual wind direction. If end laps are necessary, start at the bottom corner. Solasafe is UV-protected on one side only. Please read the label on the sheet prior to installation and check each sheet label thoroughly to ensure that the UV-protected surface faces the correct way. Sheets incorrectly installed will not withstand weathering and discolouration will result. When used vertically, face the protected side of the sheet in the direction of the most intensive sunlight or exposure to weather. If sealing is required at side or end laps, use Ampelite lap-seal tape. Incompatible sealants will weaken the sheeting and void the warranty. Clearfix Drills and Oversizes All-in-One: An alternative method of fixing, which will also speed up installation, is to use a Clearfix combination drill/cutter and weather-proof seal assemblies. These fasteners self-drill and create a correct clearance hole in the sheet in one operation. If cutting of the sheet is required, use a fine-tooth handsaw or a power saw fitted with a masonry type cut-off blade. Support the sheet close to where you are cutting. Ampelite sheeting can be custom-cut to length on order; your supplier can arrange this, if required. It is good practice to wear protective goggles when cutting any material with a power tool. To reduce noise caused by friction, due to expansion and contraction, we recommend using Ampelite Anti-noise tape, a 25mm x 3mm white self adhesive tape, along the top of battens. Store Solasafe on a flat surface, in a dry area, avoiding contact with chemicals, paints, and solvents. You could try some practice holes using an off-cut or part of a sheet which will be covered by ridging or flashings, etc. You may find it easier to drill the hole for the screw first and then enlarge this to 10mm for the washer. Use only a soft brush and soapy water – no abrasives. To prevent possible staining, we recommend cleaning when ever bird soil is apparent.